Literally translating to “wind and water”, feng shui is an ancient art form and philosophy that is at least 6,000 years old. The practice has its roots in China as a means of planning the placement of temples and tombs in a way that is conducive to the proper flow of both positive and negative chi (essentially a type of energy). Over time, feng shui evolved to include palaces and homes in its list of considerations before, in the 1970’s, making its way over to the west where it has become famous as a means of interior as well as exterior design. Then there’s the Bagua, a map of eight symbols found in Taoism which each represent a different aspect of one’s life, ranging from inner knowledge to wealth. Each symbol has a path leading to it which is either broken or unbroken in an effort to maintain the proper balance of yin (negative energy) and yang (positive energy). 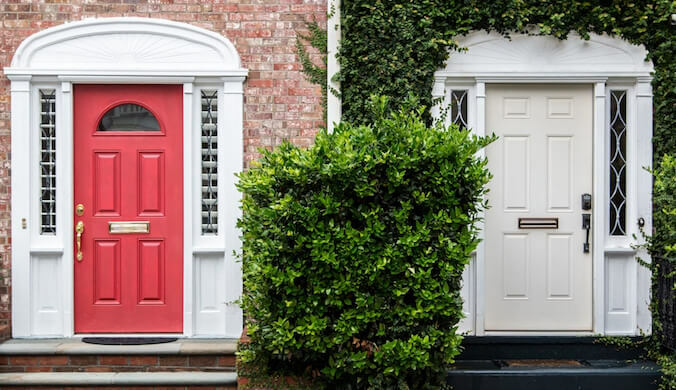 The first step to practicing feng shui outside your own home is, thankfully, also the easiest: painting your front door. Painting your front door is an important step as your front door serves as the threshold both to and from your home and, as such, will determine the type of energy which you will be carrying with you into and out of your home. Remember the list of elements and the colors associated with them? This is when they start to become important. Depending on the direction in which your door faces, different colors will either positively or negatively impact the flow of chi into and out of your home. To make things a little less complicated, there is a chart below to help you pick the right color for your door. When you’re done painting your front door, it’s time to make sure the entryway surrounding it is also conducive to the proper flow of chi. You can accomplish this mainly by cleaning up around your door (both inside and out!) and replace anything like broken pots and dim light bulbs. Also, be sure to only enter and exit through your front door; not only have you put some work into it by now but other less cared for entrances/exits won’t be anywhere near as good when it comes to taking good chi with you and leaving any bad chi where it belongs: at the door. When you’re designing your garden, also be mindful of what shape you decide to construct it in. You want to go for more winding, flowing, river-like shapes, and steer clear of boxes and hard edges as these don’t occur in nature. Since you’re already heading out to get some exterior paint for your front door, take a look at the rest of your home too. In order to achieve a proper balance with nature, your home should match its surroundings, be they natural or man-made. You do, however, want some pops of color on accents such as window trim, which should match your front door. Following this rule will allow your house to be more harmonious with its’ surroundings and attract more good chi.